I don’t know – just feeling a little dorky today. But I’m also feeling kind of cool, because one of my Etsy items was featured in this Treasury. But most of all, I’m feeling inspired. So here’s my own treasury, starting, and ending, with a two of the items I have up for sale right now. Okay, so it’s a small treasury! (Click on the pics to see the auction). Thanks to Three Column Blogger I’ve adjusted my template so I can pack everything into 3 columns. Apparently this type of setup, aka The Grid System is considered the best way to present lots of information, with a minimum of visual overload. In other words, the stylistic (and aesthetic) opposite of this site. My web guy is using a similar setup (the three columns, not that other nightmare!) for my website. I can’t wait to see how it looks! 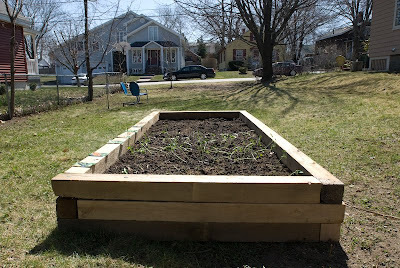 It’s not terribly impressive (yet [I hope]), but I’m quite proud of this pretty little raised garden. Every day my “gardener in crime” and I ask each other, “Any vegetables yet?” Boy, that joke will never get old! It’s the time of the year where vintage clothing takes a back seat to my vintage motorcycle. Click on the image to get to the sale. my friend diane (check out her store!) talked me into trying out roller skating at the local roller rink. i have not been roller skating since a rather traumatic experience at the age of 15 involving going out on the rink by myself during a pairs-skating song (i was really sensitive during my adolescence!). there was still plenty of opportunity for humiliation – falling onto my thumb (and spraining it), shuffling like frankenstein past a bunch of cool high school kids, even negotiating the ladies room ON SKATES. but now i just found it funny instead of awkward. 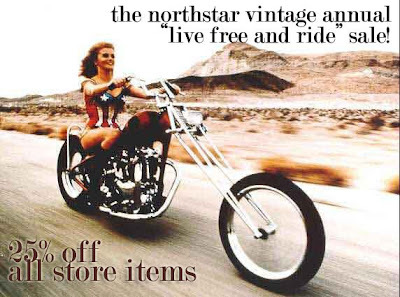 You are currently viewing the archives for April, 2009 at NorthStar Vintage.